Here are the Game Update notes for 10/18/2017. Cheers! Endor Escalation Heroic Battle is Returning! In tier 1, form a squad of 5 Ewoks (minimum 4-Stars) and battle the AT-ST and its support troops to earn Wicket shards! This tier of the event is the sole place to earn shards of Wicket through gameplay—he won’t be going to a cantina or hard node. Each time you emerge victorious you will earn a full ten shards of this iconic Ewok. In Tier 2, unlocked only when you have a 7-Star Wicket, bring any team of 7-Star units you own to battle a much more powerful version of the AT-ST. This version of the Heroic Battle is tuned to require units at Gear Level 10 or higher with powerful mods and abilities. Defeat this Imperial war machine and earn highly coveted Zeta Ability Materials! Additionally, there is now an achievement for completing Tier 1 a total of ten times! Form a squad (Nightsisters highly recommended) and join forces with MOTHER TALZIN to strike against the many enemies of the Nightsisters of Dathomir! In this Marquee event you will learn all about the Great Mother and her many powerful abilities. Once completed you will have enough shards to unlock your own 3-Star version of Mother Talzin! Rituals of Revenge with run on October 20th. Tier 2, where you will be using your own squad of Nightsisters to defeat the same team found in Tier 1 (adjusted to your player level range)! Victory in this tier awards the much requested and needed MK5 AK/T Stun Gun and MK3 Carbanti Sensor Array salvage to help you gear your characters. Unlike the previous Flash events, Advanced Tactics events will run for a 6-hour window consistently from 2PM to 8PM (player local time) each time they run (with a special bonus instance on an upcoming day). The first of these Flash events begins on October 20th so make sure to build up your Nightsisters so you don’t miss out on this event each time it runs (just like with Flash events, you’ll get a push notification when an Advanced Tactics event switches on to help ensure you don’t miss out). As with all Assault Battle events, this is meant to be a challenge, so come prepared for a fight! Secrets and Shadows will run on October 21st. Defense of Dathomir will run on Oct 20th. Tier 1 pits your team of 5-Star (or higher) Nightsisters against the attacking Separatist forces. Succeed and earn shards for Mother Talzin! Tier 1 is available to win once, and can be refreshed for crystals for one more win, each day the event runs. Pay special attention to the new abilities added for Nightsisters in this event: Hail of Arrows and The Sleeping Blood! These new abilities are limited to Defense of Dathomir, but may prove to be the difference between history repeating itself and a new era for the Witches of Dathomir. This special event also has a new achievement for completing it ten times! Rumors are spreading of strange happenings on Dathomir. A mysterious chant emerges from the caverns of the Nightsisters. Gather your strongest heroes and investigate this mysterious occurrence. Ghosts of Dathomir will run on October 31st, starting at 7am UTC. There are no forced units required for this Event, so bring your best squad! This event is level banded starting at level 20, and increasing every ten levels after that. All players can participate once they have unlocked the Events feature! 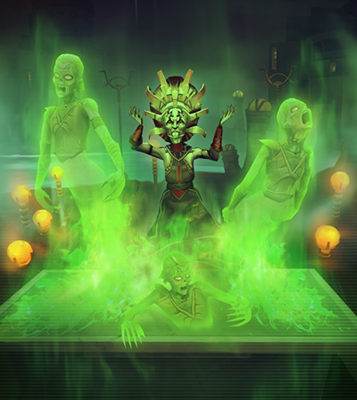 Play Tier 1 to unlock the new Nightsister Zombie and Nightsister Spirit units! A Bonus Tier, with more generous recurring rewards of these two Nightsisters, is available starting at level 70 and above. Players will be able to win the event once. The event can then be refreshed for crystals for one additional play, each day the event runs. Make sure to play the tier with the rewards that you want the most! Ghosts of Dathomir will be the exclusive source of Nightsister Zombie and Nightsister Spirit shards through gameplay, so be sure to participate in this event each time it appears (as with Advanced Tactics, you will receive a push notification to alert you if you have this feature enabled)! The Clan Mother of the Nightsisters has risen! Use this pack to power up Mother Talzin, a vicious Nightsister leader who can revive ALL of her allies with a single Special attack, and who can inflict PLAGUE, an all-new debuff preventing enemy dispels. Each pack guarantees at least 5 shards for Mother Talzin, and may drop up to 330 SHARDS! Get 25 shards of Mother Talzin with a Clan Mother Bundle! This vicious Nightsister leader inflicts PLAGUE, a new debuff preventing enemies from dispelling, and can revive ALL of her Nightsister allies with a single Special attack. BONUS:This bundle also includes Credits, XP Training Droids, Ability Materials, and Gear to immediately power up Mother Talzin. Power up Nightsister Zombie, an all-new Nightsister tank who inflicts Tenacity Down with her Basic attack, and who will revive indefinitely as long as another Nightsister is alive! Each pack guarantees at least 5 shards for Nightsister Zombie, and may drop up to 330 SHARDS! Power up Nightsister Spirit, an all-new Nightsister ally who dispels buffs and Stuns, and who constantly gains foresight to avoid enemy attacks! Each pack guarantees at least 5 shards for Nightsister Spirit, and may drop up to 330 SHARDS! Get 80 shards of Old Daka with a NIGHTSISTER BUNDLE today! This Nightsister healer now has several more powerful revive synergies with her Nightsister allies. Get 80 shards of Asajj Ventress with a NIGHTSISTER BUNDLE today! This Nightsister controller has significantly expanded attack power and now grants a significant Speed and Offense boost to her allies. Get 80 shards of Talia with a NIGHTSISTER BUNDLE today! This aggressive healer can use her basic or sacrifice her health, to give her allies even more healing and Turn Meter. Get 80 shards of the Nightsister Acolyte with a NIGHTSISTER BUNDLE today! This character is now an attacker with significantly improved abilities while stealthed and the ability to cleanse her Nightsister allies more reliably. Get 80 shards of the Nightsister Initiate with a NIGHTSISTER BUNDLE today! This Nightsister attacker now boosts her allies' Critical Chance and renders enemies immune to buffs. Power up your Ewok characters and defeat the AT-ST with an Ewok Faction Pack! This pack awards two cards worth of Ewok shards - one from the original set of Ewoks (Chief Chirpa, Teebo, The Ewok Elder, The Ewok Scout), and one from the newest group of Ewoks (Logray, Paploo, and Wicket). Each card is worth between 10-330 shards! the AT-ST Heroic Battle event. Fixed a bug where the turn removal component of Stagger wasn’t respecting Turn Meter Removal immunity. Units that are immune to Turn Meter Removal effects can still be debuffed with Stagger, but when Stagger is triggered these units will not lose Turn Meter. Fixed the incorrect levels on some enemy units from Tier 1, 2, and 3 of the Training Droid Smuggling Event. Clone Wars Chewbacca: “Wookiee Resolve” will now correctly play audio at the start of battle. K-2SO: "Enforcer" will no longer incorrectly grant K-2SO Taunt when he uses Event abilities. Wicket: "Furtive Tactics" will now calculate Critical Damage correctly. Wicket: Using "Guerrilla Strike" on an Ewok ally with Buff Immunity will now correctly grant Wicket Stealth and Critical Damage Up. German- The German translation for Cassian Andor's Zeta "Groundwork" is now correctly described to say Protection Up instead of Defense. French- The instance of the French translation for "versatile" is now correctly retranslated to "polyvalente." An old foe reveals their true face.